Three year old Damian as Chaplin. A theatre student in high school, and a Fine Arts major in college, Damian soon took to the streets as a mime, and to the stage in Kansas City for corporate events. 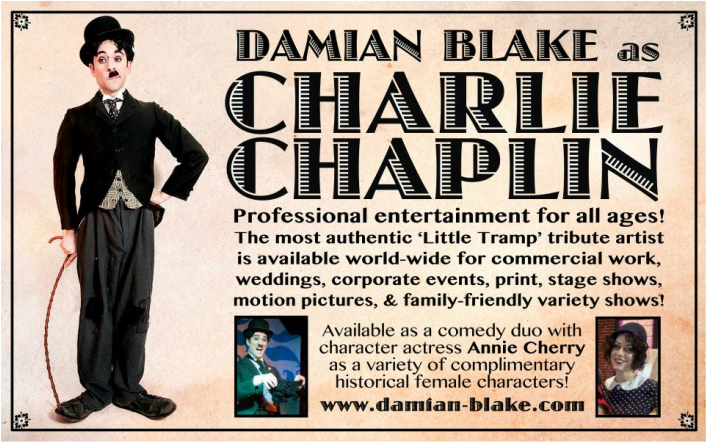 He met his wife and future business partner Annie Cherry while providing baggy pants comedy for one of her burlesque shows back in 2008. He has been lucky enough to host and co-produce large scale themed variety shows, burlesque shows, late night talk-shows, star in underground theatre productions, nationally recognized children's theatre, independent films and national commercials, and travel the globe as characters for corporate events. His Charlie Chaplin impersonation and love of classic Hollywood characters has landed him work from coast to coast. He and his wife Annie travel with members of their Kansas City production company 'The New Century Follies' to provide bawdy old-fashioned comedy across the Midwest. In his spare time, Damian is also a freelance illustrator, a collector of hats, costumes, silent film, Chaplin, and circus memorabilia, and enjoys a nice stiff drink with his wife while fixing up their old house that is full of cats and one rambunctious young man named Owen.